IBEF presents an enriched, enhanced 'India Now' magazine with more features, analysis and wider coverage. 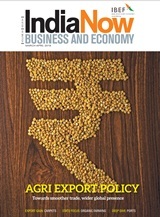 The cover story of the March-April issue talks about how the new agriculture export policy will help in cash surplus agricultural production and change the country’s focus from enhancing production to bolstering exports. India is embarking on a different path of boosting exports after years of focusing on enhancing production and ensuring food security. An agriculture export policy has been drafted to cash in on the surpluses and double farmers’ income by 2022. Focusing on export oriented production, export promotion, better farm realization and synchronization with the government’s policies will help India grow in its primary strength of agriculture and the policy is a step in the right direction. India’s unparalleled growth in export of carpets, rising from Rs 11 crore (US$ 1.5 million) in 1970-71 to an overwhelming Rs 9,205.90 crore (US$ 1,295 million) in 2017-18, has led it to become the largest exporter of carpets in the world and the country is on the path of increasing its market share over the coming years. This is possible due to the government’s initiatives which have helped the country maintain its competitive advantage. Though Sikkim may be among the smallest states in India, it achieved its ambitious dream of becoming a fully organic state in 2016. The journey to achieve this goal was arduous, but the co-operation and painstaking efforts of the people and state government were exemplary. As a result, the state has been awarded the prestigious Future Policy Award 2018. India’s ports are going to be a critical in supporting its economic growth over the coming years. The country has initiated its journey upon well-laid-out plans to expand and modernise its ports. Going forward, smaller ports are going to play a key role in development while upcoming ports rise to international standards. Byju’s- The Learning app, an online education platform founded by Byju Raveendran, who is known for his unconventional and practical methods of teaching, has grown rapidly over the years. The goal of the app was to make learning accessible, effective, engaging, and personalised for everyone. Byju’s has achieved this goal through programmes offering personalised learning journeys for individual students and has reignited curiosity among students in the process. Khadi, India’s signature fabric, has evolved over the years to gain a contemporary texture that appeals to one and all. Being handwoven from handspun yarns, it provides weavers and designers with the freedom to create fabrics of varying fabric construction. Given its beauty, capacity for customisation in fabric construction and possibilities of fabricating designer garments, Khadi has immense potential for being marketed internationally. Rajasthan, a state in the western part of India, is home to the massive Thar Desert which is becoming increasingly popular for Dune bashing. SUV’s fitted with cutting-edge technology and driven by skilled professionals zip across sand dunes giving tourists the ride of their lives. The thrill of dune bashing is complemented by slow and magical nights and the tranquillity of the desert.